Kristy McNichol (Little Darlings) plays a dorky young woman who passes out and dreams of being an 18th century damsel in love with a handsome buccaneer, played by Christopher Atkins (The Blue Lagoon). This musical spoof of pirate movies isn’t as much fun as it sounds. 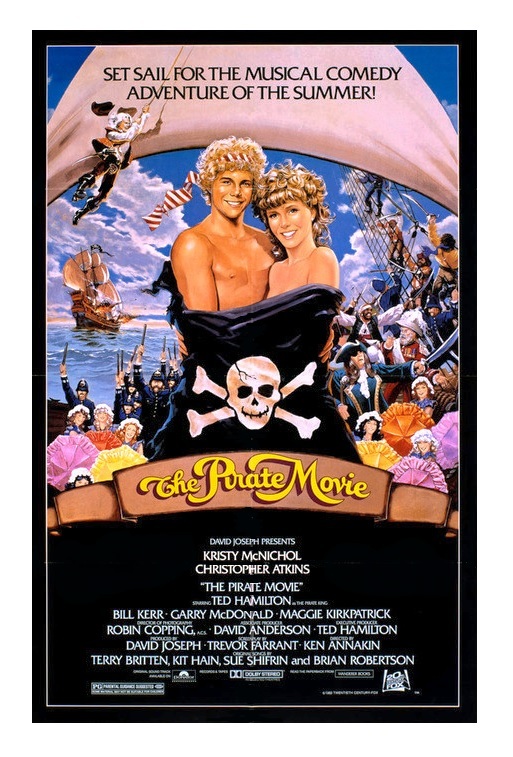 It’s loosely based on Gilbert & Sullivan’s legendary operetta The Pirates of Penzance, and it mixes the operetta’s popular soundtrack with pop songs, performed (well enough) by Kristy McNichol and Christopher Atkins. There are lots of movie references too. Sadly, The Pirate Movie doesn’t work — it was a notorious critical and financial disaster. It’s not even a case of “so bad, it’s good” … it’s just plain awful. Director Ken Annakin (Those Magnificent Men in their Flying Machines), whom I tend to like, does a terrible job mixing elements from the classic operetta with modern songs and slapstick. I did enjoy the references to the other iconic movies — The Pink Panther, Star Wars, and Raiders of the Lost Ark — but these funny nuggets aren’t able to save the movie. The Pirate Movie could have been a nice spoof ala Mel Brooks, but it doesn’t have enough funny gags — it needed more spoof and less music. Most of the film was shot in Australia’s most beautiful coastal places and the stunning natural scenery is a big plus. Even if you don’t like the movie, you will at least enjoy the magnificent locations. You can’t force me to say anything negative about McNichol, one of my childhood crushes. She is a really good actress. McNichol tries, but she’s surrounded by mediocrity. Atkins did have a surprising billboard hit with the song “How Can I Live Without Her?,” written by Sue Shifrin and Terry Britten. The Pirate Movie earns its reputation as one of the worst musicals ever made. That being said, the movie has its defenders. Lots of people who saw it on cable TV during their childhood seem to have some affection for it. What can you say to those viewers? Nostalgia is a powerful thing! As I always say, you be the judge, but don’t say I didn’t warn you! Color, 98 minutes, Rated PG.